Succession to the throne of Kuwait is limited to the descendants of Mubarak Al-Sabah. The position of Emir is also traditionally alternated between the two main branches of the Al-Sabah family, the Al-Ahmed and Al-Salem branches. The reigning emir must appoint an heir apparent within one year of his accession to the throne; the nominee for consideration as Crown Prince has to be a senior member of the Al-Sabah family. The nomination needs approval by an absolute majority of members of the National Assembly, Kuwait's parliament. If the nominee fails to win approval from the National Assembly, the Emir submits the names of three eligible members of the family to the National Assembly, and the National Assembly selects one to be the crown prince. The Prime Minister is appointed by the Emir; however the appointment of the prime minister requires approval from the majority of members of the National Assembly. The National Assembly (per article 4 of the Constitution) has the constitutional right to approve and disapprove of an Emir's appointment, therefore the National Assembly has the authority to remove an Emir from his post. The National Assembly effectively removed Saad al-Sabah from his post in 2006 because of Saad's inability to rule due to illness. Kuwait's National Assembly is the most independent parliament in the Arab world, it ranks highly in comparison to other parliaments in the Middle East as a whole. According to the official Kuwaiti sources, Sabah I was unanimously chosen for the position of sheikh. Youngest son of Sabah I bin Jaber. Eldest son of Abdullah I Al-Sabah. Eldest son of Jaber I Al-Sabah. Eldest son of Sabah II Al-Sabah. Second son of Sabah II Al-Sabah. Son of Sabah II Al-Sabah. Known as "The Great". Eldest son of Mubarak Al-Sabah. Second son of Mubarak Al-Sabah. Son of Jaber II Al-Sabah. Founder of the Kuwait Public Security Force and early stages of the Military of Kuwait. Eldest son of Salim Al-Mubarak Al-Sabah. Political leader during the Operation Vantage, invoked Section 4 of the independence agreement to request British military intervention. Introduced the Constitution of Kuwait in 1962. Introduced the National Assembly in 1963. Youngest son of Salim Al-Mubarak Al-Sabah. 1st Minister of Foreign Affairs and political leader during the Six-Day War (1967), the War of Attrition (1967–70), the 1973 Samita border skirmish and the October War (1973). Third son of Ahmad Al-Jaber Al-Sabah. 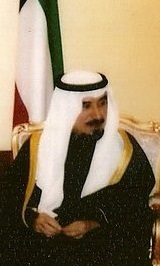 1st Prime Minister of Kuwait and political leader during the Iran–Iraq War (1980–88), the Invasion of Kuwait (1990) and the Gulf War (1991). Eldest son of Abdullah Al-Salim Al-Sabah. 1st Minister of Interior and 2nd Minister of Defense. Defense leader during the Six Day War (1967), the War of Attrition (1967–70), the 1973 Samita border skirmish, the October War (1973) and the Iran–Iraq War (1980–88). Military governor and second political leader during the Invasion of Kuwait and Gulf War. Deposed by the National Assembly and abdicated simultaneously due to illness; died on 13 May 2008. Fourth son of Ahmad Al-Jaber Al-Sabah. 2nd Minister of Foreign Affairs (1963–2003) and 2nd Minister of Interior by interim (1978). Honored and decorated by the United Nations and recognized for his graceful and exemplary resolving leadership, with respect to humanitarian mission work around the Middle East and World Nations on September 9, 2014. ^ Nathan J. Brown. "Mechanisms of accountability in Arab governance: The present and future of judiciaries and parliaments in the Arab world" (PDF). pp. 16–18. ^ Eran Segal. "Kuwait Parliamentary Elections: Women Making History" (PDF). Tel Aviv Notes. p. 1. Archived from the original (PDF) on 2015-01-04. ^ بالصور والفيديو.. ماذا قدم العرب لمصر في حرب أكتوبر (in Arabic). Retrieved 15 January 2015. ^ "United Nations Secretary-General Ban Ki-moon's Statements". un.org. Retrieved 16 September 2014. ^ "Secretary-General's remarks at ceremony recognizing the humanitarian leadership of His Highness Sheikh Sabah Al Ahmad Al Jaber Al Sabah, Amir of Kuwait". un.org. Retrieved 16 September 2014. The House of Al Sabah is the ruling family of Kuwait. Sheikh Jaber al-Ahmad al-Sabah, GCB (Hon), GCMG (Hon) of the al-Sabah dynasty, was the Emir of Kuwait and Commander of the Military of Kuwait; serving from 31 December 1977 until his death on 15 January 2006 due to cerebral hemorrhage. The third monarch to rule Kuwait since its independence from Britain, Jaber had previously served as minister of finance and Economy from 1962 until 1965, when he was appointed prime minister prior to becoming Kuwait's ruler. 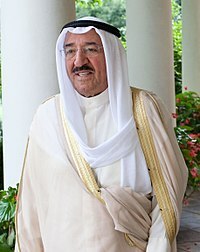 Nasser Mohammed Ahmad Al-Jaber Al-Sabah is a Kuwaiti politician who served as Prime Minister of Kuwait from 7 February 2006 until resigning on 28 November 2011. He is the first prime minister to date that never became ruler or even crown prince. Sheikh Jaber Al-Mubarak Al-Hamad Al-Sabah is a Kuwaiti politician and the Prime Minister of Kuwait since 2011. Previously he served as Minister of Defense as well as Deputy Prime Minister. Sheikh Abdullah III Al-Salim Al-Sabah was the eleventh ruler of Kuwait, the first Emir of the State of Kuwait, and Commander-in-chief of Kuwait Military Forces from 29 January 1950 until his death. He was the eldest son of Salim Al-Mubarak Al-Sabah. As the eleventh ruler of the Al Sabah dynasty in Kuwait, he took power after the death of his cousin Sheikh Ahmad Al-Jaber Al-Sabah. He also ruled as regent upon the death of his father until the election of Sheikh Ahmad. The anniversary of his coronation, 25 February, serves as Kuwait's national day. Sheikh Ahmad Al-Jaber Al-Sabah was the tenth ruler of Kuwait, from 29 March 1921 until his death on 29 January 1950. Sheikh Sabah IV Ahmad Al-Jaber Al-Sabah GCB (Hon) is the Emir of Kuwait and the Commander of the Kuwait Military Forces. He was sworn in on 29 January 2006 after confirmation by the National Assembly. He is the fourth son of Sheikh Ahmad Al-Jaber Al-Sabah. His Highness the Amir of the State of Kuwait Sheikh Sabah Al-Ahmad Al-Jaber Al-Sabah was honored by the United Nations Organization on September 9, 2014 and named leader of humanitarian work. On March 2017, he has been awarded the Honorary Doctorate from Kuwait University for his humanitarian and global role. Sheikh Saad Al-Abdullah Al-Salim Al-Sabah, KCMG (Hon) was the Emir of Kuwait and Commander of the Military of Kuwait during a short reign of nine days, succeeding Sheikh Jaber. Sheikh Saad was a general commander in the Military of Kuwait; in addition, the first to head the Kuwaiti Ministry of Interior until February 16 1978 and the first military officer to head the Ministry of Defense since 1964. The Kuwait Police is an agency of the Ministry of Interior of Kuwait, which maintains the national security envelope, defense of land border, coastal and the rule of law in the State of Kuwait. The Kuwait Police Agency was established in 1938 by Ahmad Al-Jaber Al-Sabah as the Directorate of Public Security Force. Sabah Al Khalid Al Sabah is a Kuwaiti diplomat and politician, who has been serving in different ministerial posts since 2006. In addition, he is a senior member of the ruling family of Kuwait, the Sabah family. The Kuwait National Guard or National Guard is an independent combat institution tasked mainly with the defense of the country and its territories. The National Guard traces its heritage directly to the cavalrymen and infantrymen that defended Kuwait's three mounted defensive walls. Since its inception, the Kuwait National Guard under the guidance of the respective leadership; executed, participated and supported in carrying all conflicts in which the Military of the State of Kuwait engaged since 1967. A suicide bombing took place on 26 June 2015 at a Shia mosque in Kuwait. The Islamic State of Iraq and the Levant claimed responsibility for the attack. Kuwait's Emir arrived at the location of the incident after a short period of time. Twenty-seven people were killed and 227 people were wounded. Twenty-nine suspects were taken to court and after approximately ten sessions, most of them public, 15 were found guilty, with 7 to receive capital punishment. Those include Adel Eidan, who drove the bomber to the mosque and admitted his intention to bomb the mosque and claimed that he wanted the mosque itself to be bombed, but "not the people", and Mohammed and Majid az-Zahrani, who delivered the explosives to the terrorists in Kuwait and were arrested by Saudi authorities.